Do you have a goal you've been focusing on for a long time, but you still feel as if something is blocking you? 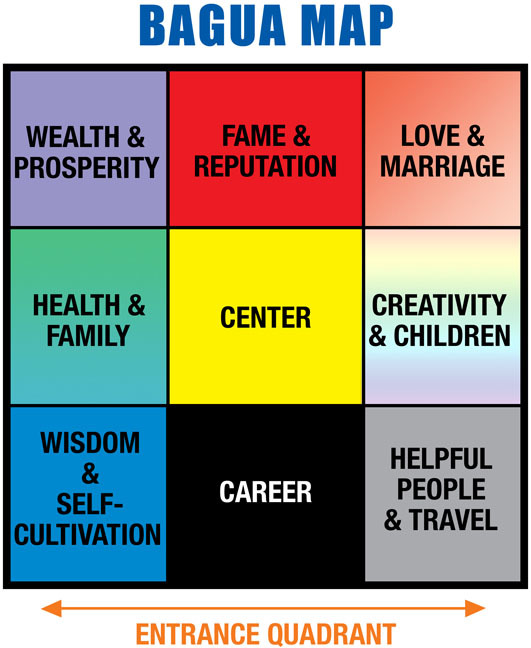 Do you feel as if your situation is so bad, you really need all the extra help you can get from Feng Shui? “Layering” the Feng Shui Ba Gua in your home or apartment can create the extra power you need to achieve your goal. Keep in mind, layering should only be used in special circumstances, to avoid stimulating the chi in too many areas of your home. Layer one trigram of the Ba Gua, at most, in a home or apartment. What is Layering the Feng Shui Ba Gua? Layering is like setting two alarm clocks in the morning to be sure you wake up for that important meeting. It's like backing up your computer files in multiple locations, or carrying an emergency kit in your car, just in case. When you lay the Ba Gua over your home, you would first lay it out over your home's main floor. But you can also lay it out over other floors, and over individual rooms and your entire property. When you use layering techniques, you would activate the chi in a specific trigram on more than floor, level or area. For instance, a single woman looking for romance may activate the romance trigram when she lays the Ba Gua over her home's main floor, and again in her master bedroom. If you're looking to increase your wealth, you might place a fountain in the wealth trigram of your backyard when you lay the ba gua over your entire property, and another water element in the wealth trigram of your home, as a whole. You could even go another step, and place a small fountain in the wealth trigram of your home office or on your desk. It's a good idea to use layering to correct for missing sections of your home, as well as to achieve goals that are very important to you.